Vikings fans woo Favre with electronic billboard in Hattiesburg, Miss. A whim that started as a Brett Favre appreciation group on Facebook has grown into a movement - with 84,000 members and counting. Fans are putting their money behind the movement - enough to pay for a digital billboard that launched late Monday night on U.S. 98 West to show Favre they mean business. "We wanted to get in front of Brett to show him some appreciation," said Karen McKinley of Minneapolis. Gerald Watts of Petal said he was eating lunch at Chick-fil-A when he saw the billboard come on the screen. "It's awesome," he said. "I think (Minnesota fans) are a class act." 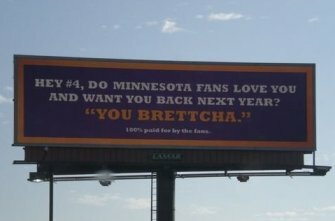 Mitch Brent of Hattiesburg also saw the billboard Tuesday, bearing the message, "Hey #4, do Minnesota fans love you and want you back next year? You Brettcha!" Click on the article link to read the full story and see a picture of the billboard. We have to say: that's a grand effort. Nice work, Vikings/Favre fans. UPDATE: Just spoke with Minneapolis resident Jay Tappe, who started the Facebook group. He sent an image of the billboard and said, among other things, "Anything we can do to get (Favre) back here. ... We all fell in love with him." Also, donations to the cause of ... well ... bringing Favre back can be made right here, e-mailer Kelly says. It's not exactly Haiti, but you have to believe in SOMETHING. SECOND UPDATE: KFAN is also planning on putting up a billboard in Hattiesburg, possibly as soon as Friday. It will read: DEAR BRETT, DEANNA & FAMILY, THANK YOU FOR COMING TO MINNESOTA. WE’D LOVE TO HAVE YOU BACK. VIKINGS FANS 4-EVER. Guess it's a good time to be a billboard owner in Hattiesburg. Tommy Lasorda tweets picture of man with "Dodger eye"